Healing Through Life Co., Inc. I believe we all have had difficult experiences in our lives. These experiences can cause pain and suffering. Difficult experiences are something that we all share. I believe we can heal from these experiences and grow from them, becoming more of who we truly are and want to be. In my work with individuals, couples, families and groups I have had the profound experience of guiding and witnessing their healing journeys. It is my intention to provide a compassionate, trusting environment to promote healing for all who work with me. I welcome the opportunity to walk alongside you as you continue your healing through life. Offering counseling and public speaking since 1989. 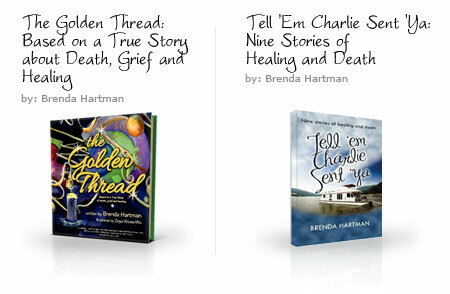 Cancer survivor Brenda Hartman is changing the conversation about death and healing in the article: Learn how to live, choose how to die. 24 accomplished leaders with extraordinary potential to make an impact in their communities were awarded with the Bush Foundation Fellowship. Click here to meet them. Brenda Hartman was chosen in 2017 for this honor read about her here. Brenda's Essay "My Walk With Death" was chosen to be included in the Kelly Culhane prize essays Upon the Arrival of Illness – Coming to Terms with the Dark Companion An Anthology.